This edition of the laws promulgated by successive Anglo-Saxon rulers over a period of five centuries was published in three volumes between 1903 and 1916 by the German historian Felix Lieberman (1851-1925), and is still regarded as authoritative. This unique body of early medieval legal writing, unparalleled in other Germanic languages, provides valuable source material for scholars of Old English and of legal history, and Lieberman's thorough engagement with the manuscripts has never been surpassed. His preface explains that owing to factors such as the extreme variability of Old English orthography, and the existence of both Latin and Old English versions of the same material, a traditional edition using just one base manuscript with a critical apparatus would have been too unwieldy. 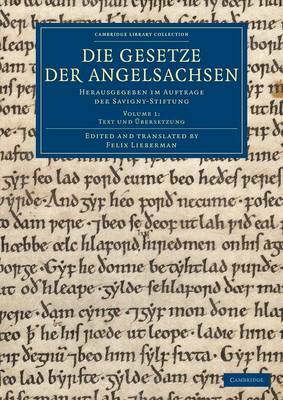 Volume 1 introduces the manuscripts, and gives several parallel versions of each text in Old English and Latin with a facing translation into modern German. Frederick Attenborough's The Laws of the Early English Kings (1922) is also reissued in this series.